Another of the insects that I photographed at La Reserva Ecológica Costanera Sur, Buenos Aires, Argentina during my early March visit. I found quite a few of these beetles feeding on the newly sprouting growth from cut stumps of a small, multi-stemmed tree. At first I thought they were leaf beetles of the family Chrysomelidae because of the way they were actively feeding on the fresh, succulent growth; however, a closer look quickly revealed them to be members of the family Coccinellidae (ladybird beetles). 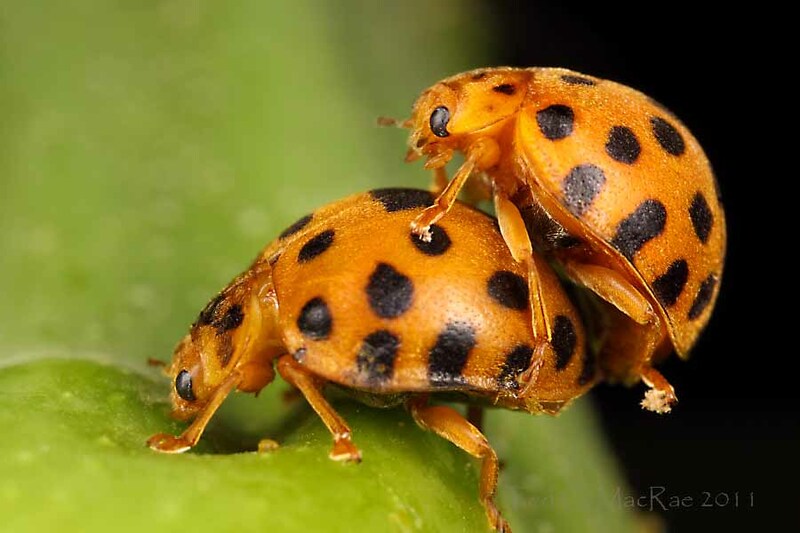 Their phytophagous, gregarious behavior immediately identified them as members of the subfamily Epilachninae, and in fact they bear a remarkable resemblance to Epilachna varivestis (Mexican bean beetle) and E. borealis (squash lady beetle) – the best known examples of this subfamily in North America. Armed with confidence in at least a subfamilial placement, I looked for references on the group and quickly found a reasonably recent revision of the subfamily for the entire Western Hemisphere (Gordon 1975) – jackpot! I reasoned an abundant species seen in the heart of the 3rd largest city in South America would likely show up on page one, but after several increasingly careful passes through the entire revision, it became clear that whatever species this was, it was not among the nearly 300 species (2/3 of them in the genus Epilachna) treated in that work. Now, the exuberant, young, not-very-sage entomologist that I was 30 years ago would have immediately gotten all excited that I had found a new species, but the older, battle-tested, more cautious entomologist that I am now instead started suspecting I was dealing with an introduced species. After all, some of the insects and plants I’ve already featured from this man-made nature reserve are introduced. I figured as abundant as the beetles were, the species had to be featured on some website, so I started with the obvious and Googled “Coccinellidae Argentina,” clicked on the very first result (appropriately titled Coccinellidae of Argentina), and found a seemingly authoritative site with links to the different subfamilies. Clicking on Epilachninae and scanning the photos, there it was – Epilachna vigintioctopunctata (28-spotted ladybird beetle). Native to India and southeastern Asia, this species is well known for its attacks on numerous solanaeous and cucurbitaceous crops (Richards 1983). It made its first appearance in the Western Hemisphere in southern Brazil (Schroder et al. 1993) and in 1994 was observed on experimental eggplant plots at the School of Agronomy, University of Buenos Aires (Folcia et al. 1996). Poetically, those initial specimens were sent to Robert Gordon at the U.S. National Museum (and author of the Western Hemisphere revision), who confirmed their identity. It seems that Argentinians are not the only ones that like to tango! Schroder, R. F. W., M. M. Athanas and C. Pavan. 1993. Henosepilachna vigintioctopuctata (Coleoptera-Coccinelidae), new record for Western Hemisphere, with a review of host plants. Entomological News 104(2):111–112. This entry was posted in Coccinelidae, Coleoptera and tagged Argentina, beetles, entomology, insects, ladybird beetles, nature, science. Bookmark the permalink. Ted, you could have just asked a (wannabe- molecular-) malacologist! (It’s also distinctly possible I messed up the ID there, pretty sure I counted 28 spots if you let some bleed into each other). Either way, the real E. vigintioctopunctata made it to New Zealand last year, as is evidently too well established to control. A near global species now. Your ID looks good to me, and (jealous!) you saw the larvae! Moving around on ornamental Solanaceae, e.g. Brugmannsia, you suppose? I couldn’t ID the tree, but its glossy, pinnately compound leaves (reminiscent of Campsis radicans) looked decidedly un-solanaceous. Solanum granuloso-leprosum, which I noted growing abundantly at the reserve (more on this plant in a future post) is the only arborscent solanaceous plant listed in this seemingling comprehensive reference, but I never saw these beetles on that much more common plant. Actually, my question was more about how it moves around the world. And that was the most popular ornamental solanaceous plant that came to mind. I know people have probably stopped reading this thread ( two weeks in internet time must be years in the real world 🙂 but thought I’d point out the photos I linked to above were actually taken on Brugmannsia leaves! Don’t know if they’re moved around as plants, or if any of the various solanaceous crops are either. I suspect pupae in pot soil is the most likely transport stage. Nice photo! I can’t wait unitl the bugs are back around here. Bugs are officially out here!